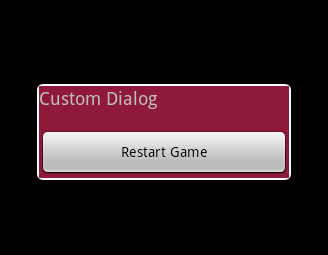 In this post I would like to describe the process of creating and displaying a custom dialog. Though the Android documentation describes pretty well the topic, I faced some problems implementing it, and I would like to share my findings. 2. The second issue I was facing was that I wanted to get rid off the standard dialog title. However, if you don’t want to display a standard title for your dialog, not calling the above line most probably won’t meet your expectations, because it will leave an empty space where the title should be. Hopefully, this is an easy fix. Just call requestWindowFeature(Window.FEATURE_NO_TITLE); and you are done. To sum up with a concrete working example, below I presented an implementation of a simple custom dialog. Nice, I like the way you cut down the code into smaller parts. Andy, you are my top liker on my blog, terabytedude.wordpress.tk, and I have decided to give you the Harry Potter Giveaway that’s happening on my blog. I’ll email you. Wow! That sounds so cool, can’t wait to get it! Which syntax highlighter are you using to write code into your post ? is it comes as plugin? I have WordPress.com free blog, how would i achieve the same as yours? Very good tutorial & well written to be easily understandable. Thanks for sharing! this is amazing read, thank you ! That is because the Dialog takes the focus. If you really want to get rid of the transparent background behind the Dialog, I believe you should create your own custom dialog. thank you so much very good information and easily understandable. Thanks for sharing!